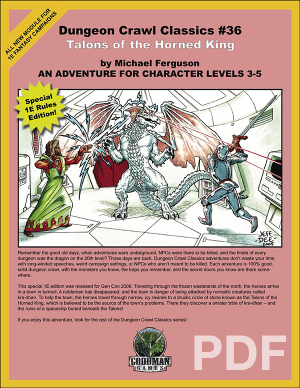 A 1E adaptation of the ENnie-nominated adventure! This is the Gen Con 2006 special. Many centuries ago, a band of paladins fell from grace. These blackguards were defeated after a great battle and their grim fortress, the Iron Tower, was razed. A small abbey was established near the ruins, where generations of monks mixed ancient eldritch wards, mighty clockwork traps, and multiple failsafes to build the Iron Crypt of the Heretics. Three mighty vaults ensured that its evils would be sealed for all eternity. But unbeknownst to the brotherhood, their impregnable crypt had a single weakness: the very monks that had built it, for they knew its secrets. When a devourer stole into their abbey, the profane beast forced the monks to help it inside the Iron Crypt. It successfully broke into the first of three vaults, releasing an army of wights. 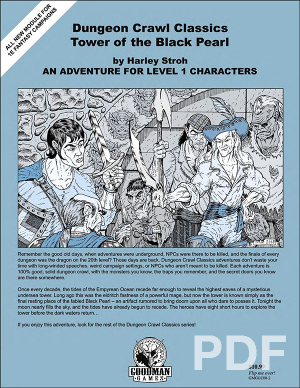 The story of the devourer and his wight army is told in Dungeon Crawl Classics #12: The Blackguard’s Revenge. 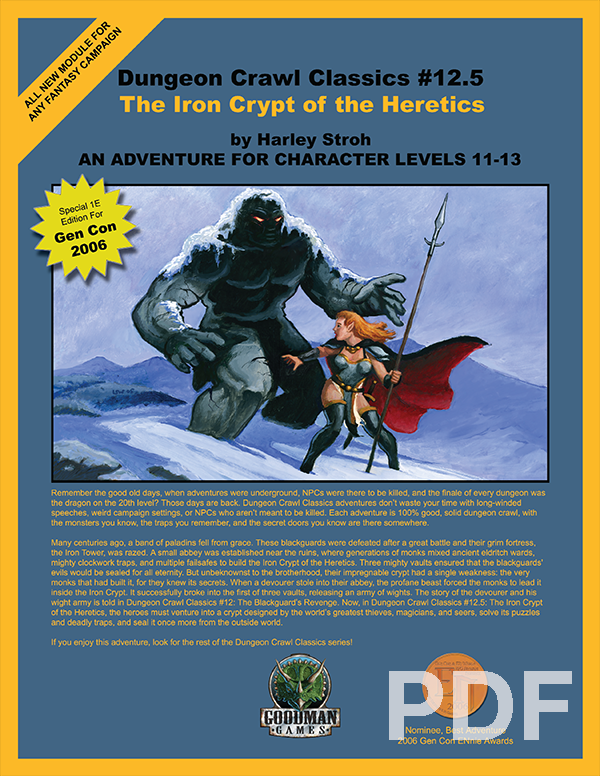 Now, in the Iron Crypt of the Heretics, the heroes must venture into a crypt designed by the world’s greatest thieves, magicians, and seers, solve its puzzles and deadly traps, and seal it once more from the outside world. 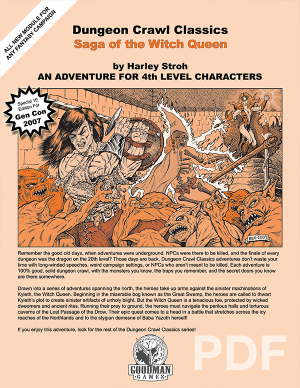 A devious, dangerous dungeon built to keep great evil imprisoned forever. 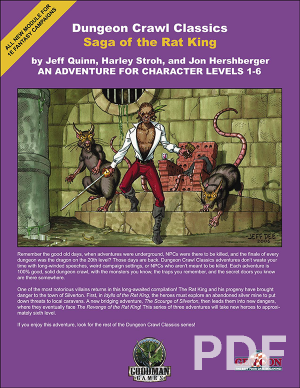 A stand-alone adventure that can be played as a sequel or prequel to DCC #12: The Blackguard’s Revenge, or on its own.